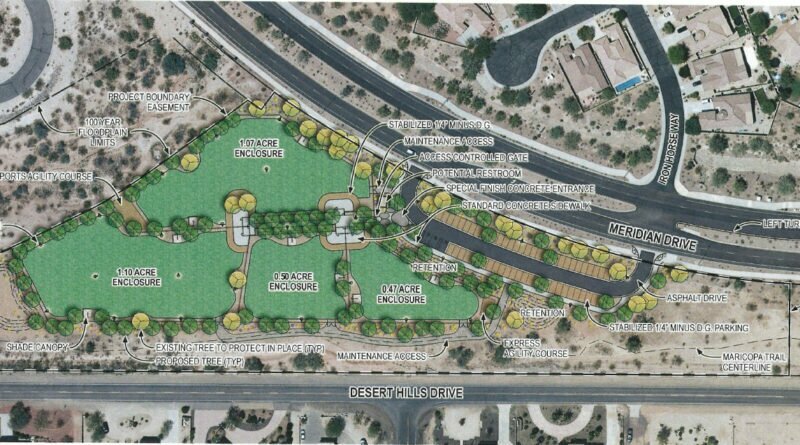 Planning for Anthem’s dog park is now centered around several questions that must be decided before a final price tag can be estimated. 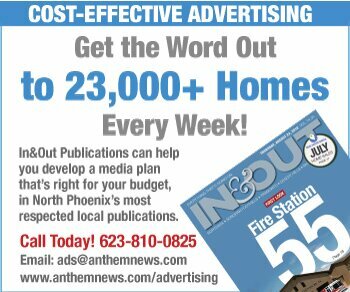 At Anthem Community Council’s monthly meeting last night, the project’s architect discussed tentative plans and options that would affect the cost. An updated site plan for the park—to be located at Meridian Drive, east of St. Rose church and Merrill Gardens on the far east side of town—shows four grassy areas. Two would be about an acre each, and two would be about a half-acre each. The larger plots would be for larger and more active dogs. The smaller plots for smaller dogs. Having two plots for each would allow for rotating the use so grass can be regenerated and maintained, explained Michael Park, a landscape architect with EPG Environmental Planning Group. Fences would be chain link with vinyl coating, similar to those at the ball fields. The entrance to each plot would have a roughly 10×14-foot vestibule where dogs can be leashed and unleashed. Each plot would have at least one dog drinking fountain, operated by a human foot-press, and at least one waste station, with bags and a receptacle. Shade trees, shade structures and benches are planned. A small agility course is optional. The park would be lighted. Hours have not been determined. The parking lot would have 58 spaces, but more research is needed to determine if fewer would be sufficient. A chilled drinking fountain for humans is planned. Restrooms are thought to be optional, but were a point of discussion. Two residents suggested council strongly consider including them. Another factor that could affect cost is the potential for a “hard dig.” If the ground is determined to be too hard, sand and soil could be placed atop the existing surface, Park said, and perforated pipes would be buried to allow drainage. He also said the size of each plot could be adjusted to save on construction costs. Each half-acre of grassy area would cost between $150,000 and $200,000 to build, he said. Last year, ACC staff estimated the park would cost around $1 million, but has cautioned many times that it was a very preliminary number. At last night’s meeting, council members expressed a desire to balance costs with quality, seeking to avoid a situation where cost-saving efforts resulted in a park that residents didn’t want to use. Council aims to review an updated concept plan and preliminary cost estimate at its Oct. 24 meeting. The park is scheduled to open by late October, 2019. The project’s planning phase comes on the heels of the Community Center remodeling, and concurrent with the construction of pickleball courts. 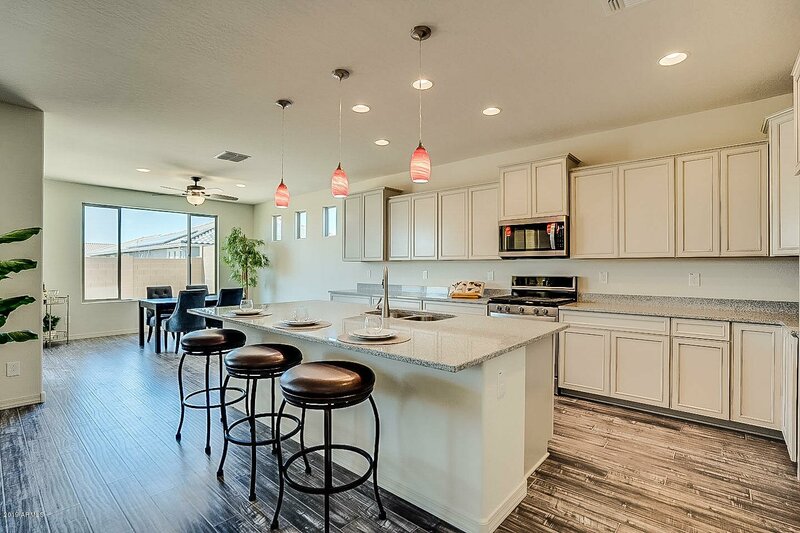 All three projects are part of Anthem’s master plan and are being paid for out of community’s enhancement fund, fed by a quarter-percent fee on home sales. The fund’s balance sits at $1.4 million.